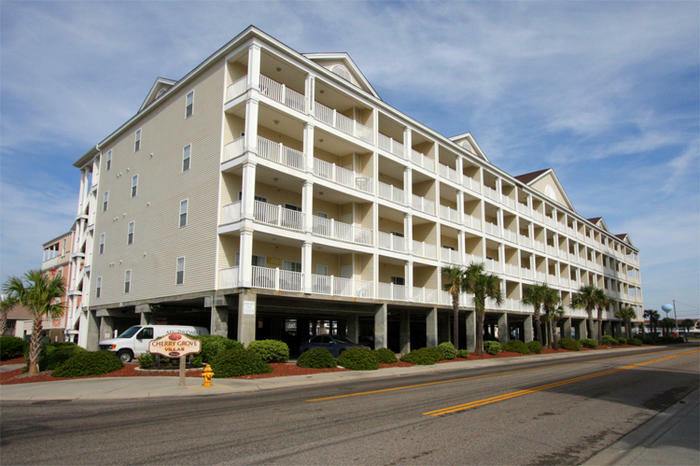 Cherry Grove Villas is a North Myrtle Beach resort that is what a luxury North Myrtle Beach vacation should be. The sparkling blue swimming pool and hot tub are on the ground level of this North Myrtle Beach resort and are partially covered. Take a refreshing dip into the bright blue water and enjoy a leisurely soak in the hot tub during your North Myrtle Beach vacation. Parking is available under the building. Stairs are at both ends of this North Myrtle Beach resort and elevators are on the southernmost end. So it s easy and fast to get from your North Myrtle Beach condominium to the beachfront or to the sparkling blue swimming pool at Cherry Grove Villas. Enjoy the good life as you embrace a North Myrtle Beach vacation that boasts this much style. You may live luxuriously while being across the street from the white sandy beaches and just down the street from so many North Myrtle Beach area amusements and attractions. Being on the second row in the Cherry Grove section of North Myrtle Beach, SC is a fantastic location for a family beach vacation. The beaches are wide and beautiful across the street from Cherry Grove Villas. At low tide it appears as if you can walk seaward for miles. The sandbars are fun places to explore. Put on goggles and search the sandbar for sand dollars and beautiful, unbroken seashells. Float on the Atlantic Ocean as the tide ebbs and flows. Go for long walks and veer toward the nearby fishing piers. Build sand castles with the kids and play games all day long. Spending hours and hours soaking in the sun and swimming in the surf is part of the fun of a North Myrtle Beach vacation at Cherry Grove Villas. Get up early when you stay at Cherry Grove Villas and cross the street first thing in the morning for an oceanfront sunrise. Your North Myrtle Beach vacation will be better for having set your alarm and taking your coffee to the beachfront for a memorable sunrise. This morning light show is dazzling. Equally as beautiful is watching a star-filled sky that is lit by the moon. Having the beach right across the street from your luxurious condominium in North Myrtle Beach, SC is terrific. You can race back to your comfortable North Myrtle Beach vacation rental for a bite to eat or something cold to drink. No need to pack up all your belongings and load the car to return to your condominium. Cherry Grove Villas is a charming condo complex in North Myrtle Beach, SC that is fantastically close to championship golf courses, seafood restaurants, shopping, live entertainment theatres and so much more. There are more than 100 golf courses in the Myrtle Beach area. Make tee times and enjoy hours on the links or at the driving range improving your swing and perfecting your game during your North Myrtle Beach vacation. The number of restaurants in Myrtle Beach is astounding. You can make this North Myrtle Beach vacation one for the senses as you try all the fresh seafood, homemade desserts and Southern cuisine readily available for your family at these delightful restaurants. Myrtle Beach shopping is close to Cherry Grove Villas. Barefoot Landing, Broadway at the Beach, Market Common and the outlet malls are the most popular places to shop when you are in town. And there are nearly one dozen live entertainment theatres nearby, too. Get tickets for the Palace Theatre’s special performances, the Carolina Opry, Pirates Voyage, Alabama Theatre and House of Blues during your North Myrtle Beach vacation. Your family will appreciate your close proximity to these attractions when you stay at Cherry Grove Villas.